Scooper - Technology News: Why is Japan's economy shrinking? Why is Japan's economy shrinking? The news that Japan’s economy shrank at an annualised rate of 1.4% in the last quarter of 2015 has come as a severe blow, even for a country used to difficult economic news. 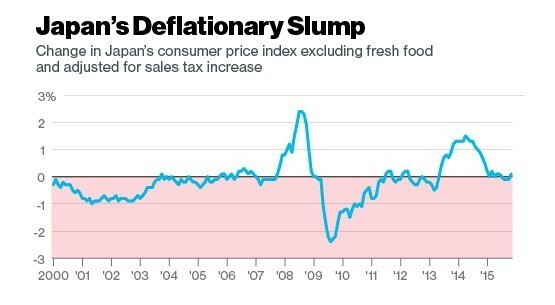 The contraction was worse than had been anticipated and casts doubt on Prime Minister Shinzo Abe’s Abenomics – his drive to lift the country out of stagnation. The world’s third largest economy has been battling deflation for 20 years. Prime Minister Shinzo Abe pledged to lift Japan out of its malaise with ally Haruhiko Kuroda, governor of the central bank, committing to doing “whatever it takes”. But after a promising start, Abenomics appears to be faltering. The new figures show that the economy shrank between October-December last year with slower exports and weak domestic demand being blamed for the contraction. Japan's economy stagnated in the 1990s after its stock market and property bubbles burst. Companies focused on cutting debt and shifting manufacturing overseas. Wages stagnated and consumers reined in spending. Once deflation set in consumers started to expect prices to fall and they delayed spending for as long as possible in order to save money. That perpetuated the problem and continued the cycle. Japan’s ageing population is now making the problem even worse. By 2020 the country will be losing around 600,000 people a year. Getting growth from an ageing, shrinking society is difficult. 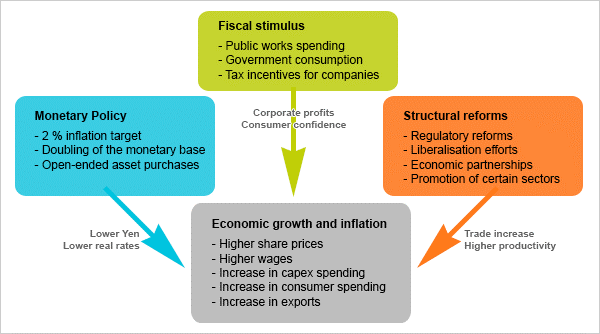 Abenomics is the term used to describe the economic policies of Prime Minster Abe. They are built on unprecedented monetary easing, government spending and business deregulation . The Prime Minister calls it his “three-arrow” strategy, borrowing the image from a Japanese folk tale that teaches that three sticks together are harder to break than one. What does that look like in reality? The Bank of Japan’s money printing project has been described as a " money-spewing bazooka". The programme of quantitative easing (printing money to buy bonds) is currently running at $660 billion a year. The basic aim is to get money flowing again and increase spending and consumption. Another core aim of Abenomics has been to boost exports by lowering the value of the yen. Between 2012, when Prime Minister Abe began this term in office, and 2014 the value of the currency was driven down from around 80 yen to the dollar to 120 yen to the dollar. But the yen has been getting stronger again. In the last two weeks it has gone up from 120 yen to the dollar, to 112 yen to the dollar. That prompted the central bank to push interest rates below zero for the first time ever in an effort to discourage people from buying into yen as a ‘safe haven’. It also hoped that domestic corporations and consumers would be prompted to spend rather than save. Volatility on the Japanese stock market, negative interest rates and now worse than expected GDP figures all serve to pile the pressure on Prime Minister Abe and the viability of his Abenomics programme. Some of the economic gains made since Mr Abe came to power in 2012 have now been reversed and even before the size of the latest economic contraction was known, there was speculation that Abenomics was failing. Of course, Japan is not the only country facing uncertain economic times at the moment but after linking himself so closely to the policies now under strain, Prime Minister Abe is feeling the pressure more acutely than most.